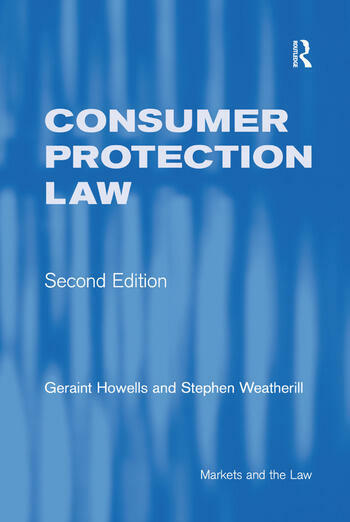 This fully revised and updated second edition of Consumer Protection Law introduces the reader to the substantive law of consumer protection in the United Kingdom, the emphasis being on the place of United Kingdom law within an evolving European legal system and also on the need to draw upon comparative experience. The book not only seeks to place consumer protection in its purely black-letter context but also draws upon wider readings to show that consumer protection law is a complex area of law which reflects and shapes the individual citizen's position within the modern economy. Contents: Preface; The map of consumer protection law; European Union consumer policy; The quality of goods and services; Product and service liability; Unfair terms; Consumer credit: private law; Regulation of trade practices from doorstep to internet; Trade descriptions, advertising and unfair commercial practices; Public regulation of consumer credit; Consumer safety; The regulatory offence; Competition policy and the consumer interest; Consumer law enforcement in England and Wales; Access to Justice; Index. Geraint G. Howells is Professor of Law at the University of Manchester, and Barrister at Gough Square Chambers, UK. Stephen Weatherill is Professor of Law at the University of Oxford, UK.